SmartPractice launches the Halloween Campaign Idea to help dental offices promote oral health and patient loyalty. 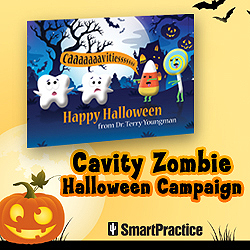 The Cavity Zombie Halloween Campaign by SmartPractice aims to provide a seasonally appropriate way for dental offices to promote oral health and patient loyalty. The campaign includes a free printable Cavity Zombie Coloring Sheet and a new selection of dental-themed Halloween postcards, laser cards, and supply bags. Leveraging the pop culture appeal of zombies, dental offices can use these SmartPractice products to engage patients in cavity prevention by scheduling consistent dental appointments, maintaining good oral care habits, and limiting candy intake through the Cash for Candy Buy-Back Program advertised on the Halloween cards. This campaign will launch August 17, 2015, with sample packs available upon request. SmartPractice recommends using the Cavity Zombie Coloring Sheet to reward patients and keep the importance of good oral health top-of-mind. The Coloring Sheets can be incorporated into coloring contests, where participants exchange their completed sheets with their dental offices for functional prizes such as glow in the dark toothbrushes, glow in the dark lip balm, or silver reflective tote bags. To promote practice recognition, dental offices can also include these products in supply bags at community events. All products mentioned can be personalized with the practice name and information, which SmartPractice keeps on file to expedite future orders. Additionally, SmartPractice provides professional dental design services so offices can create their own unique postcards, laser cards, and supply bags to build their brands. To learn more, visit smartpractice.com/halloween, or call 800.522.0800.